"We want to bring the old fans to the new show and the new fans to the old show," said Stephen Hill ("Luke Cage"), who plays TC in the new CBS reboot of "Magnum P. I. ", the best friend of ex-Navy Seal Private Investigator Thomas Magnum ("Jesse Stone"). Magnum lives in the guest house of famed unseen novelist Robin Masters. "I called Roger E. Mosley (former TC) and he called me back! He said, ‘This is your role'." The "Magnum P.I." reboot premieres Monday, September 24, 2018 at 9 p.m. ET starring Jay Hernandez ("Six Degrees") as Thomas Magnum. The original detective series ran from 1980 - 1988 and stayed at the top of the ratings for five straight years with Tom Selleck as Magnum (ex-Navy Seal private investigator), Roger E. Mosly ("Hangin' With Mr. Cooper") as TC (ex-Marine helicopter charter service owner) and Larry Manetti ("Walker, Texas Ranger") as Rick (ex-Marine bar owner). "Robin Masters is an author who heard all of our stories of P.O.W., wrote about it and became a millionaire. We (veterans) formed a bond," Hill explained about the background for the show. The reboot of "Magnum P. I." is about the same. The backdrop is Hawaii with Perdita Weeks taking the role John Hillerman had as Higgins the ex-British Intelligence Officer who is Robin Masters' straight-lace estate care-taker. Higgins still owns two Dobermans, Zeus and Apollo, who help guard the estate. Zachary Knighton ("Happy Endings") takes on the role of Larry Manetti as Rick. Comedy is still intertwined with this reboot of "Magnum P.I. ", a criminal investigative series. Stephen Hill ("Blue Bloods") said that Roger E. Mosly's helicopter flying was faked back then, but he actually was flying one - to get a feel for it. The 62 Emmy Award winning comedy series "Murphy Brown" gets a reboot by CBS also with the top four actors returning with Five-time Emmy winning Candice Bergen ("Boston Legal") returning as Murphy Brown. Candice, as with the original series, is also co-executive producer. 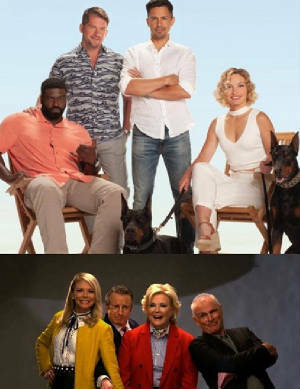 "Murphy Brown" premieres Thursday September 27, 2018 at 9:30 p.m. ET. "I wrote the script and handed it to Candice," said Diane English, creator and executive producer of the original and reboot. "And I said let's do it," Candice added. "To be back there, we're just grateful. We moved the show to New York because that is where I am." The original "Murphy Brown" aired November 14, 1988 to May 18, 1998 with Bergen, as Murphy Brown, a famous investigative journalist and anchor. This new version has Murphy as a host of her own cable morning show "Murphy in the Morning." Her three co-workers return - Faith Ford ("Another World") as Corky Sherwood the lifestyles reporter, Joe Regalbuto (The Sword and the Sorcerer) as Frank Fontana the investigative journalist and Grant Shaud (Antz) as Miles Silverberg the producer of the morning show. "The show will focus on freedom of the press and the 1st Amendment," said creator English. This "Murphy Brown" has to deal with 24 hours of news, social media news and fake news. The 13 episode comedy series has Murphy's son Avery, played by Jake McDorman (Manhattan Love Story), all grown up and working as a Conservative anchor on a rival morning show. The original show touched on single parenting, which was look down on then, but the reboot of "Murphy Brown" deals with freedom of speech in a world full of fake news.